In today’s legal marketplace, increasing competition and the commoditization of legal services has put more pressure on attorneys and law firms to stand out from the crowd. Simply put: it’s impossible to differentiate when your potential clients don’t notice you. Even worse, if your online presence isn’t professional, your clients will choose another firm. Paradoxically, it might be better not to have a website at all if the alternative is a poorly designed site with bad content and missing information. Your brand, including your website, impacts your business and your potential to find new clients and grow revenues. Poorly executed website design is the reason I left my midsize law firm 10 years ago when I founded crowdSPRING (where 200,000 designers and writers from around the world help law firms, attorneys, startups and businesses with logo design, web design, graphic design and naming). Shortly before I left my law practice, I led a redesign of the firm’s website, working with a leading vendor in the legal space. But after several months and a big reveal, I was very unhappy with their work – it made our firm look just like tens of thousands of other firms in the U.S. and made it impossible for us to stand out. In frustration, I looked for a better way to help law firms, startups, businesses and agencies with logo design, web design, graphic design, and naming. That’s how crowdSPRING was born. Large firms spend hundreds of thousands of dollars on their brands and often, tens of thousands of dollars and sometimes hundreds of thousands of dollars on website design. Smaller firms don’t have a budget that size. The truth is that you can get a great website design for much less (small web design projects on crowdSPRING start at just $899). Whether you work with an agency, a freelancer or post your project on crowdSPRING, here are 10 essential web design best practices and tips. We’ll point you to great resources and examples and highlight recent changes in web design. And if you already have a website but are considering a website redesign, it’s a good idea to start with your homepage. 1. Keep the design simple, fresh, and unique. Your website reflects your brand. It is the first impression a visitor will form when they visit your site for the first time. If you use an off-the-shelf template and your website looks like hundreds of other firms on the Internet, you’ll miss an opportunity to create a unique impression. Why would a potential client remember your site when she has seen dozens of other sites that look just like your site? 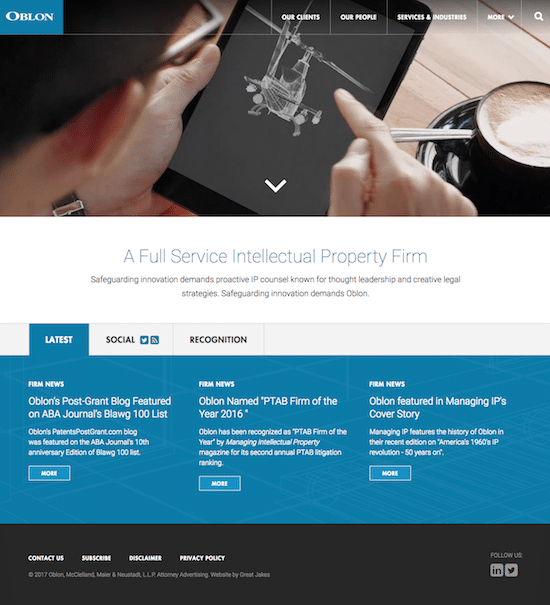 Take a look (above) at the homepage for TSMP Law Corporation, a boutique Singapore law firm. The page is airy, engaging, and different. In fact, if you visit their site, you’ll see that the main image rotates and shows a few variations, including highlighting their women attorneys. The site looks different from most law sites and that’s a good thing. Consider the impression you want to make and the message that you want to communicate to your clients and potential clients. 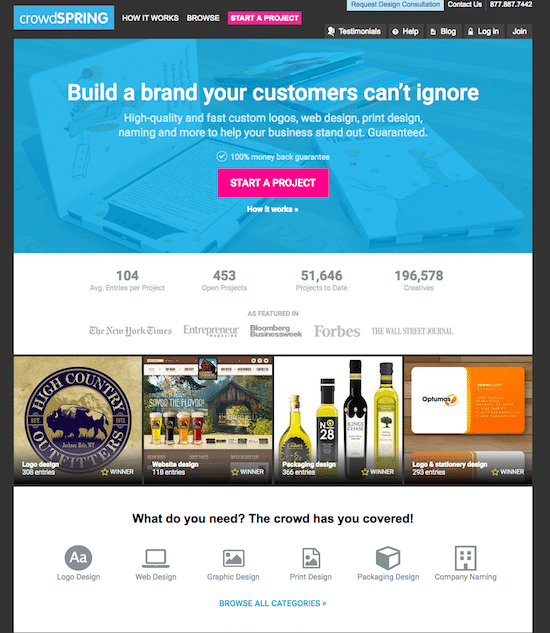 To simplify the message, incorporate large Hero areas in your homepage design. Even if you are not familiar with the term, you’ve seen “hero areas.” Hero areas are large blocks (typically an image and text or just an image or text) on a website’s home page. Their size and prominence draws the visitor’s immediate attention. It also sets a visual tone for the rest of the page and site. 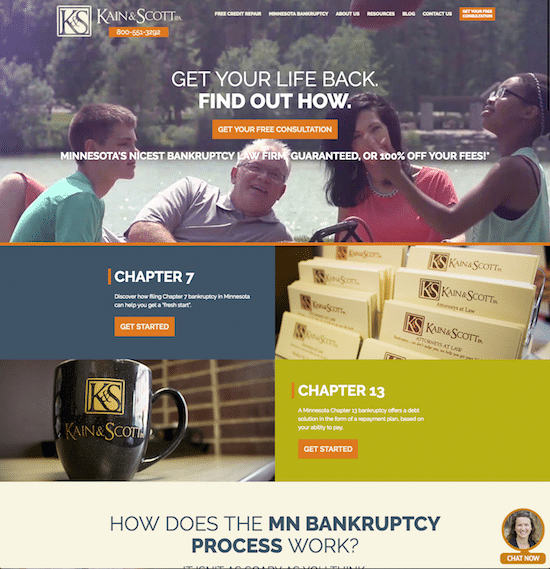 Here’s a great example from Kain & Scott P.A., a Minnesota bankruptcy law firm. It’s pretty clear what type of law the firm practices. In fact, if you visit their homepage, you’ll see that the Hero is actually a rotating video, giving you a fresh, unique look at the firm’s attorneys. 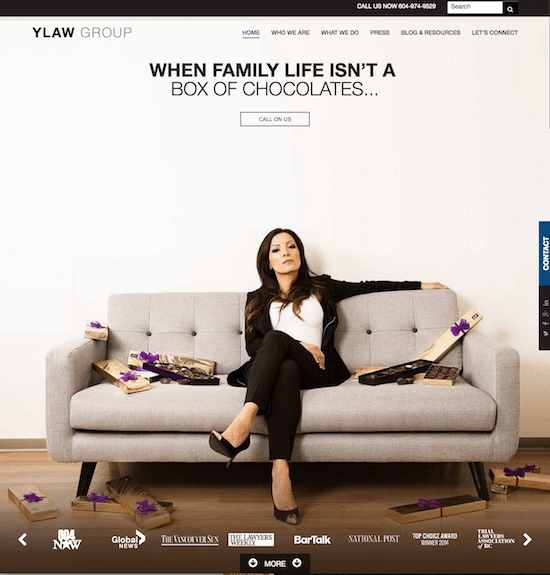 Another terrific example is Ylaw Group, a Vancouver family law firm. Take a look at how effectively they use rotating Hero images and simple text to underscore the types of issues people worry about when dealing with divorce. Even big firms strive to keep things simple and focused. 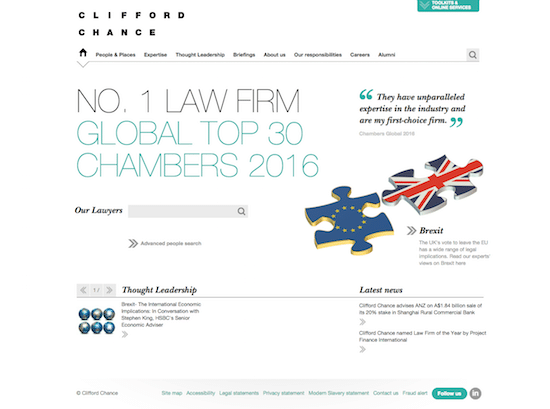 Take a look at how Clifford Chance focuses on a few core things in its Hero area. But notice how their Hero is less readable and not nearly as crisp as the two examples above. Global firm White & Case takes a different approach, incorporating several Hero images in its homepage, as you can see on the right, below. This is less effective because the page is more noisy and not nearly as easy to read. When you consider the content to include on your homepage, keep one very important fact in mind: visitors typically read only 28% of the words during an average visit. Don’t overload your homepage with a lot of text and images. Again, compare the examples above and see what you find to be more readable and more powerful. Consider the most important content and images you want your visitors to see and get rid of everything else. Many people mistakenly try to include too much content on a homepage – and this creates confusion and a poor user experience. In this case, less IS more. Consider too that your visitors might be visiting from laptops and mobile phones, so try to avoid designing pages for a large monitor size or pages that use more complex features such as flash animation (you should NOT be using flash in 2017) or complex navigation. Tip: As you consider your site design, be sure you have a professional logo design. A logo created from clip-art or a template won’t be unique and will create a poor impression. Even worse, it may expose you to substantial legal risk. Tip 2: You can implement modern design trends to make your site look current. For example, flat design has become popular. If you’ve used iOS 7 and later versions of iOS on an iPhone or iPad, or Windows 8, you’ve seen flat design first-hand. Flat design eliminates gradients and shadowing, making images and fonts smaller and easier to read. Other 2017 design trends include simple animations (including cinemagraphs – live animated images/video), bigger images, illustrations, more scrolling, and bigger fonts. You can see these features in the examples we share in this post. For even more about recent design trends, I recommend you read Ten Sensible Web Design Trends for 2017. Advanced Tip 1: Once you design your homepage, you can run very simple tests to figure out which buttons, colors, and pieces of content earn the most clicks. After all, marketing is as much a science as it is an art. For more about A/B testing, I recommend you read 7 Dead-Simple A/B Tests You Should Run on Your Homepage. Advanced Tip 2: Particularly on your homepage – but also on any pages where you’re trying to persuade the user to take some action – think about what action you want the user to take and create a prominent call-to-action button. For tips on creative effective calls to action, I suggest you review 10 Techniques For An Effective ‘Call To Action’. You should incorporate minimal textures and subtle gradients, where appropriate, to highlight different areas of the site. The call to action (CTA) on your homepage is an important element to draw visitors deeper into your site. You should consider a few important factors when you design your CTA, including: (a) location (above the fold – visible on the monitor when the page first loads is typically ideal), (b) make sure the CTA stands out from the other content on your site (notice how the crowdSPRING “START A PROJECT” CTA is pink? ), (c) create a link to another page so that your call to action will draw the visitor deeper into your site, (d) create a less-emphasized alternative variation (notice the “How it works” link below crowdSPRING’s primary CTA, (e) and test design, content, and placement. It’s important not to overload your homepage (or any page, for that matter), with CTAs. Pick one or two and focus on those. If you have too many, you’ll create a tremendous amount of noise for visitors and that will lead to much confusion. 2. 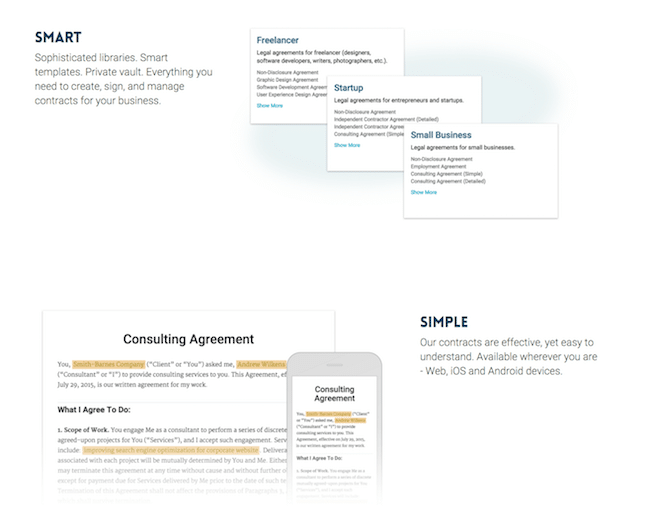 Showcase your services and attorney profiles. You’re selling a service. Make sure that you clearly showcase that service on your homepage. Ultimately, prospective clients are looking for two important pieces of information when they visit a law firm website: what services your firm offers and attorney profile pages. I’ve seen many law firm web designs that failed to effectively show their products or services and many others that tried to showcase far too many services on one page, creating a lot of noise and confusion. You have only a few seconds to make a first impression and you should make sure that the impression you make is professional. For example, Loevy & Loevy is a successful civil rights & whistleblower firm. 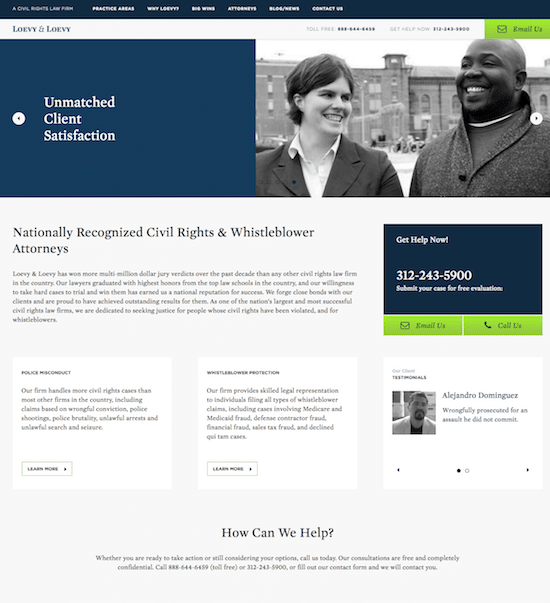 When you visit their homepage, it’s pretty clear that they focus on civil rights and whistleblower cases. This is reinforced throughout the homepage design (and on other pages). In fact, “A Civil Rights Law Firm” is left of the main header navigation, right above their logo, to provide further emphasis. If your service is web-based, consider using images of phones or computers and embed your showcase images within those images. That will help people anticipate how they’ll engage with your service. 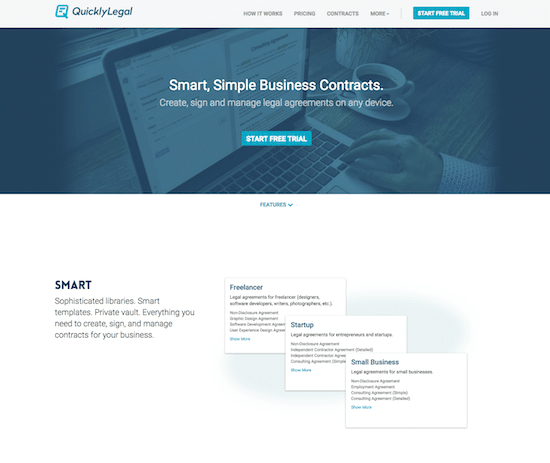 For example, take a look at how Quickly Legal (Smart, Simple Business Contracts – helps entrepreneurs, small businesses and freelancers create, sign and manage legal agreements on any device) shows their product on their homepage being used on a laptop screen. The examples continue lower on the page, showing examples of the product in use. Tip: Don’t overload your site with photos or graphics. Although it’s been said that a picture can say a thousand words, pictures can also confuse and diffuse attention. Pick a few good shots and feature those. Advanced Tip: Use testimonials to create a positive image for your firm. Testimonials (as a design element) can effectively communicate with prospective clients. Sure, you can have a dedicated testimonials page, but consider sprinkling testimonials throughout your design. 3. Pay Attention To Site Load Times. People are impatient when browsing websites and slow load times impact conversions (getting people to buy your products or services). If your site design is graphically intense, you need to make sure you’ll have the hardware infrastructure and bandwidth to support the designs. You can improve your site load times by picking good hosts and making sure your design is simple. The cheapest monthly hosting option does not typically offer the best value. It might be cheap, but is also likely to be slow and unreliable. Tip: want to compare how quick two sites load in comparison to each other or see how fast your site loads? Here’s a free tool you can use: PageSpeed Tool from Google. 4. Make your site easily accessible. Keep the web design and navigation consistent throughout the site. Don’t create unrelated designs for different pages on your site. All the pages should have a similar overall layout and design. This is one of the most common reasons attorneys and law firms will consider a site redesign for 2017. 5. Organize your site to provide a better user experience. Search engines prefer websites that are properly organized. People also prefer good organization. Keep in mind that when your prospective clients visit your site, they’re typically looking for specific information. They’re rarely going to read entire pages – they’ll skim headlines and small portions of text and look at photos or graphics (but not all of them on the same page). A properly structured site that presents information in an orderly and organized way will be much more successful than one that appears chaotic. 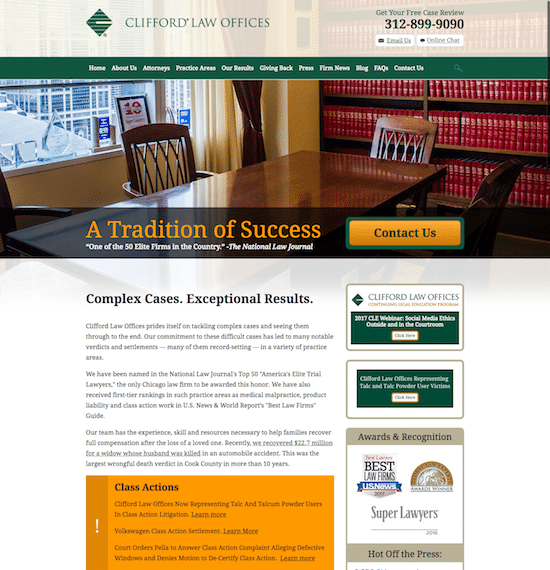 Take a look at how Clifford Law Offices, a Chicago based personal injury law firm organizes their site using the navigation menu. 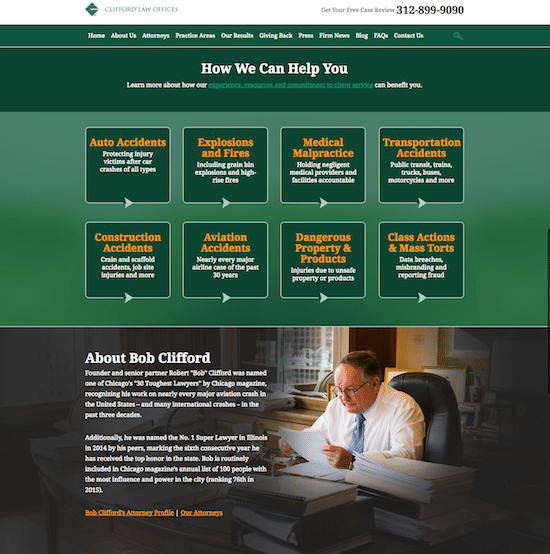 As you scroll the homepage on the Clifford Law Offices site, you’ll see additional organization, focusing on specific types of cases that Clifford Law Offices handles. Remember, that a prospective client is initially looking to see if your firm handles certain types of cases, so it’s important that your homepage answer this question effectively. Tip: Use bold, easy to read fonts and bullets to present key information or to stress things you want the readers to notice. Add text color to stress the most important information, but try to keep your use of text color and fonts to a minimum. You want to emphasize, not confuse. Also, keep in mind that most people will ignore content if the headline above the content doesn’t interest them – so don’t ignore good headlines (more on that in tip 6 below). 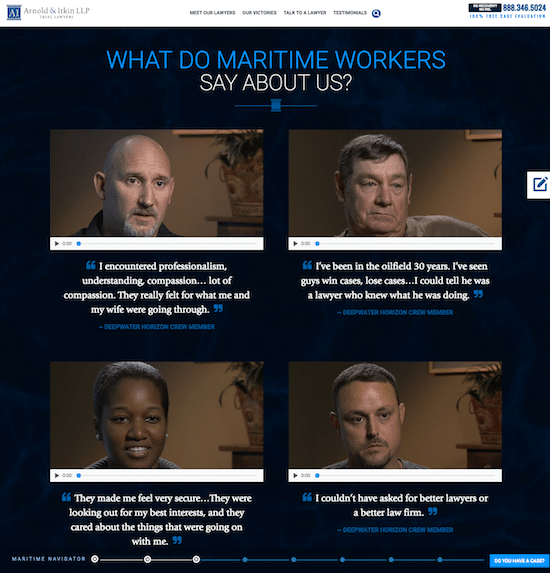 For example, take a look at how Arnold & Itkin LLP, a law firm focusing on maritime law, emphasizes client testimonials on their homepage. Advanced Tip: action buttons/links should be clear and unambiguous. For example, “Save” is not the same as “Submit.” Consider a visitor’s expectation when they click a button or link and make sure that your labels properly set those expectations. Whenever possible, make sure your copy reflects complete sentences and not isolated words or phrases. For more about effective CTAs, I recommend you read 17 Best Practices for Crazy-Effective Call-To-Action Buttons. You probably already know that search engines index sites based on the quality of content (and links). The more content on your site, the more attractive your site becomes for search engines (more about search engine optimization in tip 9 below). People also like content. In fact, poor content can quickly cause a visitor to leave your site. Don’t ignore headlines – they can be very powerful and can mean the difference between a visitor reading the rest of the content and leaving your site. Take a look at how Robert Weinberger deals with this on his law firm site. The content is clean, crisp and easy to read. Keep the content fresh and current. If your 2017 website has content dated from 2013, your visitors may quickly leave your site. For example, take a look at how the C.A. Goldberg firm, a law firm focusing on internet abuse and sexual consent, uses counters as you scroll their page to give you a flavor of their successes, “by the numbers” (visit their page to see this live). One other small insight from the C.A. Goldberg site. Notice the “Fast Exit” button in the top left? It’s a nice touch because victims of internet and sexual abuse might be living with their abusers and benefit from a quick way to exit the page. Clicking that link takes you to the weather.com site. Ultimately, you should focus on user experience (UX) when you consider what content to include on your site. There’s one question we should be asking when we consider UX, and rarely do. Why do you want that button? That page? That section? That call to action? That image? Let’s say you want to put a “Like Us on Facebook” button on your law firm website. Makes sense, right? Most folks, when evaluating whether that button is working are going to evaluate the numbers and then try, try again. They’ll change the color. They’ll put it somewhere else. They’ll make it bigger or smaller. They’ll tweak the text. But if the data consistently shows that next to no one is clicking that button no matter what changes are made, it becomes clear that you missed asking yourself why you need it there in the first place. Just because all the cool kids are doing something doesn’t mean it’s right for you. Content can also support navigation. 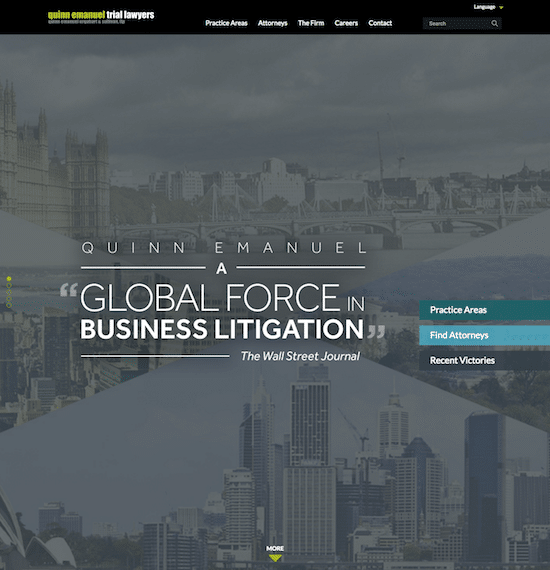 As an example, take a look at how Quinn Emanuel, a successful trial law firm keeps its homepage clean, simple and focused. The secondary navigation (to the right) emphasizes the most important information that prospective clients want to know when they visit a law firm site: what do they do, who the attorneys are, and is the firm successful? And don’t forget that you’ll want to have robust attorney profiles. Remember that prospective clients choose attorneys before they choose a firm. A good attorney profile should include awards, publications, experience, education, and highlight successes in prior transactions or cases. Custom photos will help because people connect with images more than with words. Tip: Study your successful competitors, firms you admire, and the examples shared in this post. Look at their websites and study how they present their services to their clients and potential clients. Study their site colors, voice, use of graphics, illustrations and photos, and the overall site organization. Don’t be afraid to use bolder colors. In the past, people have used muted colors, but we’re expecting to see more saturated and vibrant colors in 2017. Don’t be afraid to be different. For example, take a look at how Oblon, McClelland, Maier & Neustadt, L.L.P., a full-service intellectual property firm, showcases technology on their site in a video (you’ll need to visit the site to see the animation). Advanced Tip: Consider using larger, more readable font sizes for your content. As screen resolution has improved, many displays show smaller fonts in a too tiny to read size. Take a look at some of your favorite websites and consider which font sizes you prefer for viewing/reading. With few exceptions, you probably prefer sites that use larger fonts. Too many firms use tiny fonts on their pages, making the content unreadable. 7. Understand the difference between design and development. To build a website, you’ll need both design for the site and development of the site. Although some agencies and freelancers can do both, the skills for design and development are typically different and you may want to leverage different people for each part of the job. Frontend developers tend to focus on the client side – what your visitors see when they visit your website. Backend developers usually focus on the interaction between the server and databases. Backend developers often work on a number of things, which include scripting to permit your visitors to interact with the site, web server configuration, and developing e-commerce features, such as a payment system. Good freelance web developers are skilled in multiple areas, including web design, information architecture, usability engineering, web content management systems, web server administration, database administration, software engineering, project management, network security, and search engine optimization. Today, every website design benefits from an easy to use content management system (CMS). Such systems allow the firm’s non-technical staff to maintain and update content on the site. Bigger sites might require custom systems or modifications of existing systems. Tip: If you decide to hire a freelance website designer and/or developer, you should look for at least three people (or shops) and ask them for detailed quotes. You should also remember to ask for a few examples of their prior work so that you can evaluate their style and experience. crowdSPRING has some of the most talented web designers in the world who have helped over 1,000 attorneys and law firms with logo and web design – we’d love to help if you want to consider us as one of your options. 8. Consider the domain but don’t obsess about it. In the past, some firms tried to get exact word matches to take advantage of search engine rankings. When URLs were more easily obtainable, this was easier to do. For example, an attorney specializing in personal injury law in Chicago might get the domain chicagopersonalinjuryattorney.com. But search engines have made numerous algorithm updates over the years and this is no longer a recommended practice. If you’re unable to find a URL that matches your business name, you can consider changing the name or finding an alternative URL that includes the name – or one that complements the name. Avoid domains that are too long. Your firm might have five named equity partners but that doesn’t mean your domain should include all of their names. A good example is Oblon, McClelland, Maier & Neustadt, L.L.P. Their domain is simply oblon.com. A shorter, simpler domain is easier to remember and easier to type. I’ve been through the naming process many times and it can be a very frustrating experience. If you need help, consider leveraging the 200,000 creatives on crowdSPRING to help you find a great new name (including a domain). Tip: Consider how the URLs on your site will look to search engines and people. Where you can (this is not difficult to do when you use content management systems – such as a WordPress blog), use natural sounding names for your URLs and titles. For example, the How It Works page on the crowdSPRING site has the following easy to read ULR. 9. Don’t forget search engine optimization (SEO) and search engine marketing (SEM). For a law firm, just like for a small business, efforts spent on one marketing initiative typically take away from other marketing initiatives. Search engine optimization and search engine marketing are highly specialized fields and require a substantial investment of time to learn. But SEO and/or SEM campaigns can provide great leverage to attorneys and law firms and as a result, should not be ignored. We’ve written about this for small businesses, and you might find some of those posts helpful. We recommend 10 Practical Small Business SEO and SEM Marketing Tips. For additional tips, I recommend PPC Tips for Small Business Owner and How To Leverage Rich Media SEO for Small Businesses. If you’re new to SEO, this is a terrific guide from Moz: The Beginners Guide to SEO. 10. Use a responsive design. A responsive design fluidly changes and responds to fit any screen or device size. This is becoming increasingly important because mobile devices are accounting for an increasing percentage of web traffic. In fact, some businesses, like Facebook, have more people accessing their sites via a mobile device than a desktop computer. This trend has been going up for years and will continue in 2017. There’s no turning back. Your prospective clients will access your site from desktops, laptops, tablets and mobile phones. In many cases, 50% of prospects access law firm websites from mobile devices. In fact, Google and other search engines offer numerous search engine ranking benefits for websites that are responsive. Above and to the right is the Ylaw Group site (discussed above) when viewed on a small screen. Notice how the menu is collapsed into what’s called a “hamburger menu” on the top right, and how the text and images adjust to the screen size. To learn more about responsive web design (and see examples how sites implement responsive design), I recommend you read The Pros and Cons of Responsive Web Design vs. Mobile Website vs. Native App. For some interesting stats on why responsive design is important and more background on responsive design, I recommend you read The Web in 2016: Long live responsive design. Can you suggest other tips and best practices for attorney and law firm web design in 2017? If you have a question about web design best practices, we’d love to hear from you in the comments. 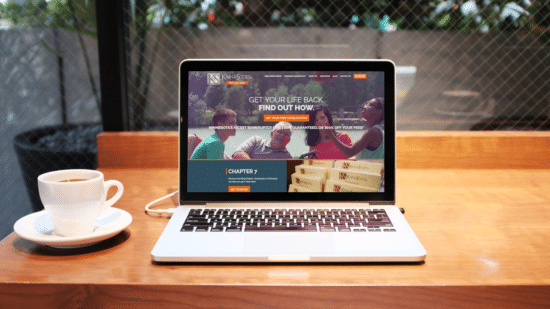 Ready to invest in your law firm web design? It’s not as expensive as you think! 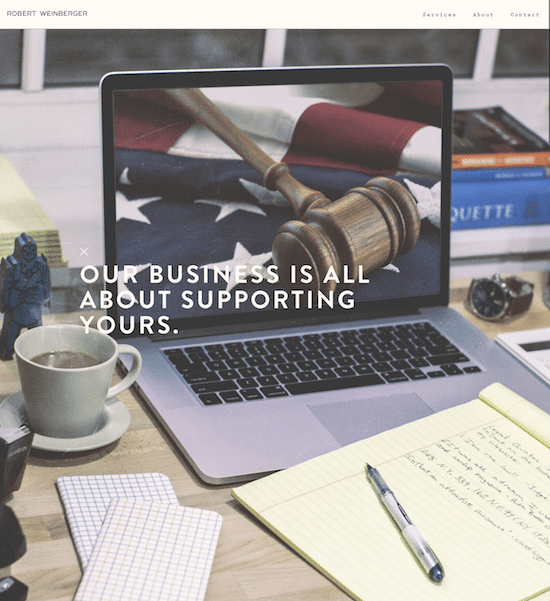 Many law firms and lawyers in the U.S. and from around the world have turned to crowdSPRING to create professional, unique website designs for as little as $899. crowdSPRING’s Web Design Service offers a step-by-step creative brief that helps you outline your firm’s needs and allows you to work with multiple designers to find the perfect web design that reflects you and your brand.